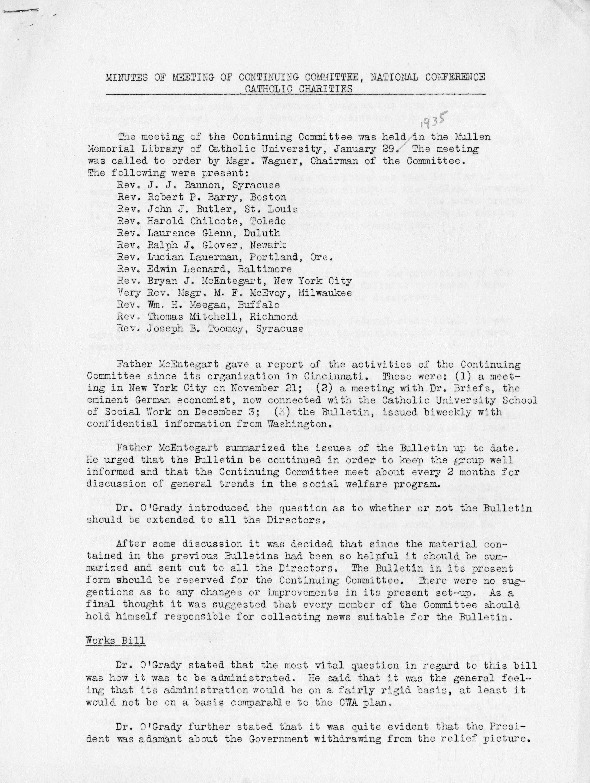 The introduction of the Economic Security Bill (later renamed to the Social Security Bill) into Congress opened up new points of discussion for NCCC: instead of debating the best course of action to recommend, the Diocesan Directors could focus their efforts of concrete changes to proposed legislation. In their January 1935 meeting, shortly after the bill was introduced, the Directors debated the various elements of the Bill. One of their chief concerns was the problem of coordinating administration of social security programs between federal, state and local levels. What are some of the differences between old-age pensions and old-age insurance? Which did the NCCC favor? The minutes record the varying opinions of directors from diocese around the country. How do you think their experiences with local problems influenced their views of the Economic Security Bill? How do you think the committee's views on the role of the Federal government in administering programs had changed since they first began meeting the previous fall? Why was child care such an important issue for the Diocesan Directors?